Welcome to ModdedControllers.co.uk, The UK's number one source for find custom and modded controllers for your games console. We make buying a new custom controller as easy as possible for you. It does not matter whether you are looking for an Xbox 360, PS3, Xbox One or PS4 controller, you’ll be sure that you will be able to find exactly what you’re looking for here on this website. But now with added bonus, you can search for a create your own custom PS4 and XBOX One controllers with our create your own controller option, to have a completely custom controller the way you want to with your design. Choose the colour of the shell buttons and thumbstick, also add a splatter effect or add you own custom logo or gamertag to the controller. The choices are truly unbelievable. We have been doing this a long time and no 2 custom controllers have come out looking the same, you can be sure you will have one of a kind that will make you friends so jealous. We have a huge range of modified / custom controllers that you can choose from that are already pre-designed that are our top choices. We really take pride in providing you and the gaming community with top quality, in-house products not only to enhance your gaming experience but also look really really cool. Whilst we aim to exceed your customer service expectations every step of the way, so please feel free to contact us with any queries or enquiries you might have. Whether it is a question of how the controllers work or if you need help finding one. All of our products that we have on offer to you are of the highest quality. They are modded by our highly skilled tech guys who only use official Microsoft and Sony controllers bought from authorised Microsoft and Sony distributors. The tools and other products we sell are sourced from highly reputable manufacturers or they are from the manufacturers of that product. Best of all we are gamers so we know what you want from your custom modded controllers. Rapid fire, drop shot, quick knife, auto spot, auto burst, quick reload and much, much more! We know how difficult it can be to purchase a modded controller online since there are so many places that sell them, so we decided to put all the best custom controllers on our site to make your life that little bit easier. Do not forget to check out our new sections to the site, we now have a page for custom and modded PS4 controllers UK, but also for modded and custom Xbox one controllers. 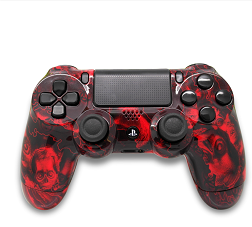 However, we also have plenty of other things on our site such as PS3, PS4 controller accessories, PS3 stock controllers, Xbox 360 and Xbox One controller accessories, Xbox 360 stock controllers and so on. Basically, if you want to buy anything that has got to do with controllers then we’ve got you covered! To find what you’re looking for, simply click on one of the categories that are in the sidebar of our site. After this, you’ll see the range of products that you can buy from our site. We automatically show you the best selling products, but you can always change how we sort products, with options such as “Price (Low to High)”, “Price(High to Low)”, “Customer Review Score” and “Random”. Don’t forget that you can also see special offers and our best selling products from our homepage too. Just scroll down to see them. What are these mods you talk about? We get this question a lot, especially from the parents buying a controller for someone else, so here is the low down for everyone that wants to know. A Mod is a modification to the controller board in the controller its self, these will allow the controller to perform special or extra actions to the gamers favourite game. For example, in first-person shooters, there is a common move when shooting someone to drop into the prone position so when the enemy goes to shoot back they miss as they have quickly moved to laying on the ground. This is known as a drop shot, what the mod chip will allow is for the gamer to automatically move the prone position when he or she starts firing their weapon. This both saves time for the gamer as they do not need to move their fingers and push an extra button and also enabling them/yourself to focus on the strategy of the game. There are many different types of mods that can be installed on these controllers, to help you out we thought we would give you some quick info on some of the tops mods people use on their controllers. With this mods it will increase the gun's rate of fire, you will also be able to fine-tune the rate at which the rapid fire works, this works with most of the major first and third person shooters. Auto aim does what it says, it will automatically aim onto the target. The only downside is that this will only work on Zombies in Call of Duty Black ops 1 and 2. When you activate this mod as soon as you start firing your weapon your character will immediately drop to the prone position. This helps with your chances in a gun fight as you move out of the gun of incoming bullets. This is also known as Jitter fire to some people, what this mod does is transform and burst fire weapon into a fully auto firing gun by removing the lag between the bursts. Does everything it says, with this you will be able to reload your weapon 1.5x to up to 3 times faster than you can do it. This of course mean you will be able to get back to firing your weapon even quicker. These are just some of the mods that can be installed on your controller. Also, check the controller to which mods it can have installed. All the information should be in the descriptions. If you any looking to pair up your custom controller with a new gaming chair then you really should go over and check out the reviews at gamerchairs.uk. They have been reviewing the top gaming chairs and brands with all the information you will need to know about getting the right chair for your setup.